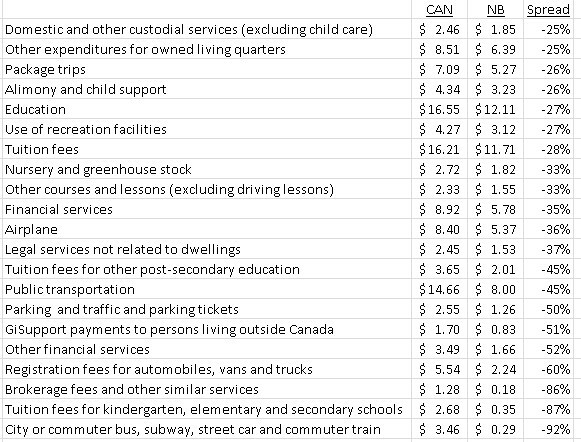 New Brunswickers spend a lot more on satellite TV, electricity, funerals, gambling, out-of-pocket health spending, RVs, child care, trucks, landline telephone services, etc. At the same time we spend a lot less compared to the rest of Canada on air travel, public transportation, alimony/child support, education, parking etc. as summarized below. While it is kind of fun to look at data such as this you have to treat each one separately and understand the underlying dynamics. That’s a valid point and you SHOULD do a blog on each one independantly. For public policy purposes, each of those is pretty important, but I think a lot of the differences are due to an aging population. If you have fewer young people, you’ll have fewer divorces and child care payments, and spend more on funerals. But ‘averages’ only go so far. Somebody taking the bus in Saint John actually pays MORE than somebody taking the bus in Waterloo. However, because during much of 2011 there was no interprovincial bus service, that average will drop way down. 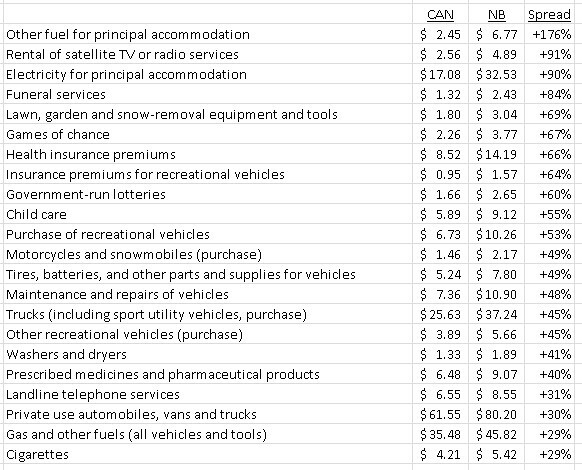 Interesting how much more NBers are paying for health insurance premiums and other insurance and drugs. I can flag about half of those as rural things (no bus available so I need my own vehicle, spend more on gas. No cable available in the boonies, buy a satellite dish. People in rural houses spend more to heat their homes then people crammed into townhouses or apartments. They have their own washers and dryers.